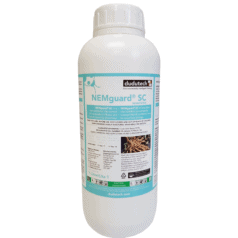 NEMGUARD® is a polysulfide solution for powerful smart defence against plant parasitic nematodes. NEMGUARD® is a 99.9% concentration of specially selected polysulphides. NEMGUARD® may be used on all crops and is applied as a soil drench or spray. Shake the product well prior to use. Add standard adjuvant to the spray tank at a rate of 1L/ha. Drench application: Drench 8L/Ha NEMGUARD once every three months. For better results integrate with Dudutech Soil Health products Mytech and Trichotech. When nematodes come into contact with NEMguard® the polysuphide molecules penetrate through the cuticle, and a lethal biochemical chain reaction begins, causing the nematode to die due to oxidative stress. SPRAY APPLICATION: 1L/1000L water per Ha. DRIP/DRENCH APPLICATION CHANGE 8 L/Ha in a 3-4 treatment sequence spaced at 3 weeks between each treatment. First application should be two weeks after transplanting. Store NEMGUARD® in a cool dry place in original container, away from direct sunlight. It can be stored for up to two years from date of manufacture in original unopened container at temperatures between 10 – 20°C away from direct light.